The Basics of Cancer Immunity Dc-Based Immunotherapy: Gliomas as a Paradigm Disease? It is a privilege to write the Foreword for this book which is an outstanding review of cutting edge cancer immunotherapy. Despite early promises in some cancers, immunotherapy had generally failed to achieve consistent success. This scenario has changed drastically in the past few years. Indeed, Science Magazine hailed the advances in cancer immunotherapy as the number one breakthrough in all scientific disciplines for 2013. The chapters of the book encompass all the different aspects of cancer immunotherapy and are authored by worldwide authorities in this field. There is a nice introductory chapter by the editor J. Song who provides a broad overview of the field. All chapters have a focus on clinical application and translational medicine. Individual chapters discuss the basic immunology of cytotoxic T cells, NK cells, dendritic cells, and regulatory T cells. Cancer vaccines draw attention in the dendritic cell chapter as well as in a focused separate chapter near the end of the book. Cytokines are also discussed extensively with a chapter discussing the role of IFNα as a vaccine adjuvant. Potential therapeutic roles for cytokines of the IL-12 family are the basis of another chapter. Extensive consideration of technological advances is a focus of the book. These methodologies include genetic engineering of T cells, targeting of T cell co-stimulation, and antibody engineering. Adoption of such technologies has shown marked clinical responses in a variety of cancers. A limitation of the field of adoptive T cell therapy has been the challenge in generally sufficient numbers of antigen- specific T cells. The generation of such antigen - specific CTL using iPSC technology then is a fascinating potential solution as proposed in Chapter 10. I would like to congratulate the editor, J. Song for bringing together a stellar group from around the world to summarize the current state of the art in the reinvigorated field of cancer immunotherapy. Battling cancer is an all-time endeavor of both clinicians and scientists in the past several decades; however, the patient outcomes have not been significantly improved with those efforts, which urge people to find new strategies to change the status quo. In recent years, in the awareness that the human immune system has its intrinsic mechanism to control microbial pathogens and dysfunctioned self-tissues, therefore, people started to conceive the idea of treating cancer by using the immune mechanism that shortly has become a major research field coined as cancer immunotherapy. After gaining solid evidences in recent years that immunotherapy has critically enhanced the prognoses of cancer patients, it acclaimed a wider recognition from the society, for instances, it has been named the 2013 Science’s Breakthrough of the Year. Of note, at this cheerful moment, it is a great pleasure and honor for us to provide our understandings and perspectives in cancer immunotherapy by presenting this book to our respected audiences. We hope this book will help audiences comprehend the concept and mechanistic studies involved in this emerging but booming subject of cancer immunotherapy. The key feature of this book is it attempts to summarize different approaches have been studied and used in cancer immunotherapy based on the different components of human immune system. The book lists the major immune system components which have been demonstrated involving in limiting or killing tumor and their relevant applications in treating cancer patients. In addition, general introductions of engineered as well as targeted cancer immunotherapies are also included in this book to further broad the scope of our audiences. In summary, this book serves as a big map trying to picture all major branches in cancer immunotherapy; meanwhile, it also tries to pull different information together to give our audiences a general impression of utilizing components of the immune system in treating cancer. In terms of the organization of this book, first of all, in the opening section of this book, it briefly summarizes the major features of different components of human immune system then introduces the relationships and interactions between tumor and the immune system. Later on, it focuses on the immunity of different immune components that against tumor and their relevant applications in clinics. The second section emphasizes on the cancer immunotherapy by using engineered components of the immune system to treat cancer, such as engineered antibodies, T cell receptors and cytokines. Following this, the concluding section of this book puts some outlooks on the emerging studies in designing of potential new cancer therapies, for example, targeting costimulatory signals in controlling T cell function; applying stem cell as a novel source of T cells in treating cancer; restraining aberrant regulatory T cells in cancer patients, and modulating tumor microenvironment to minimize its suppressive effects on anti-cancer immunity. Hopefully, this book series will provide an introductory description about this complex concept of cancer immunotherapy. For the best comprehension and use of the knowledge and insights this book provides, readers are highly recommended to read the references listed at the end of each chapter and browse up-to-date literatures on specific topic readers are interested in. 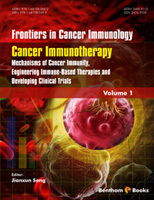 Also, we acknowledge that it is merely possible to cover all detailed information about this fast-growing specialty of cancer immunotherapy in this book through our limited efforts, therefore, we sincerely encourage our readers to keep searching the most updated literature and we believe this is the most efficient approach to capture the essences in cancer immunotherapy.